Orville and Wilbur grew up in Dayton, Ohio and their mother died in 1889 when Wilbur 22, Orville 18 and their sister Katherine 15. The siblings then continued to live with their father, Bishop Wright, for decades to follow. The family read heavily and widely and in 1896, Wilbur became interested in human flight after reading about German glider enthusiast Otto Lilienthal. In 1899, Wilbur wrote to the Smithsonian in Washington inquiring about available reading on aircrafts and human flight and the assistant secretary of the Smithsonian provided pamphlets on aviation as well as a list of books. In 1900, the brothers for several months left Dayton and the bicycle shop they had opened and went to Kitty Hawk, on the North Carolina Outer Banks, to start the path towards flight by working with a glider they built. The Wrights saw flight as being controllable through the concept of "wing warping" (or "wing twisting") with movements of the wings enabling airflow to cause movements of the plane. They then returned to Kitty Hawk in 1901 and while back in Dayton the following winter, had huge advances forward with a wind tunnel they built, a wooden box 6 feet long and 16 inches square that they used it to test how glider wings should be set to get them to operate as desired. In the spring of 1902 they built a new glider using what they learned from the wind tunnel and from successful glider trips, then started on the step of building a motor. In December 1903, they flew for the first time with the motor providing power, each brother going up separately so that in case one killed, the other could continue the work and in 1904, they began flying outside of Dayton. The flights were successful, but didn't attract a lot of media attention, with in September 1904, Amos Ives Root for his company's beekeeper trade journal writing of Wilbur's first attempt to fly in a complete circle. The plane was catapulted in the air, then flew 20-25 feet above the ground and landed successfully, with the article appearing in January 1905 to little notice. Around this time the Wright brothers tried to get the U.S. Government interested in their efforts, but to no avail, even though nothing was asked for, and by the fall of 1905, the brothers knew how to fly and were doing flights of 25 miles or more. With the lack of interest from the U.S. Government, the brothers were negotiating the sale of a plane to the French and Wilbur in May 1907 sailed for Paris to negotiate and then Orville sailed for Paris and brought a plane with him. The brothers returned home, leaving the Flyer in storage in France and in Feb 1908 signed a deal selling it to the French contingent upon a public demonstration that summer. By May 1908, Wilbur and Orville were in Kitty Hawk flying and starting to get press attention, then both returned to France and in August, Wilbur did a successful flight for the public which led to huge media acclaim. He continued doing demonstrations and they were big news in the U.S. as well and Europe and that same year Orville began doing more public demonstrations in the U.S. In 1909, the brothers as well as Katherine were in Europe and sensations with demonstrations in front of huge crowds and they returned to the U.S. heroes in May of that year, with continued public demonstrations of flying, including for luminaries and around New York City. Wilbur died of typhoid fever in May 1912 at 45 and Orville continued flying until 1918 when he stopped at 46 due to lingering pain from injuries suffered in a plane crash, and then he died of a heart attack at 77 in 1948. 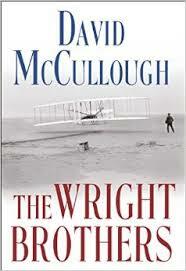 The details from McCullough were interesting and what struck me about Orville and Wilbur's story from the book was how the brothers knew that while the calculations and technology had to be right to enable human flight, what was just as important was practice, through many hours spent flying, they were become proficient at it.